I'm not much into risotto but as I had some short grain rice which I didn't want to waste, I decided to cook up a small serving of it. This simple recipe cannot be any simplier. All you need is just time! 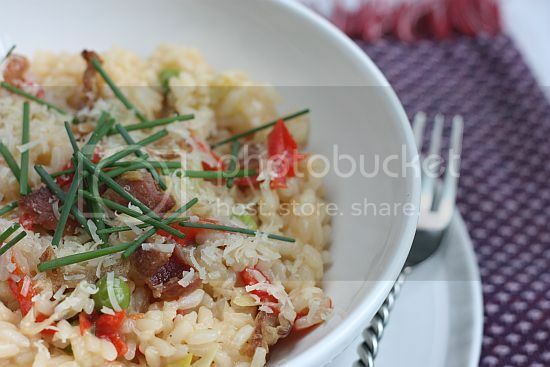 Risotto is actually an Italian dish that takes a longer time than cooking normal rice. When it is done well, this dish has a rich, creamy texture, with each individual grain of rice standing out clearly and having a hint of a bite, rather than being soft or mushy. Nowadays risotto also comes in pre-packed boxes and you can find this in most good grocers. All you need to do is just add water. But with most instant meals, the essence of preparing it and having fresh flavours is totally gone altogether. Making risotto may sound like a complicated process to a newcomer. I personally don't think it is. It starts with frying rice with the ingredients until everything is well coated. The white wine is added and the mixture is continually stirred until the wine has evaporated. Next, broth is added in small amounts at a time, whilst continuously stirring the rice. The entire cooking time can take between 20 to 30 minutes depending on the quantity of rice being cooked. 1) Heat up your stock and keep it warm. 2) Heat the oil in a large pan and fry the bacon until crisp. Remove and set aside. 3) Turn the flame to medium. Stir in the leeks, frozen peas and red pepper in the pan and cook for about 5 minutes. Add the rice and cook for 2 minutes. Pour in all of the wine and keep stirring until all the wine has been absorbed. 4) Then add the chicken stock into the rice, one large ladle at a time. Stir and wait until all the stock has been absorbed before adding another ladle. Continue to do this for about 25 minutes until the rick is just cooked and the risotto resembles a creamy consistency. 5) Season with salt and black pepper to taste. Then stir in the bacon, parmesan and chives, saving some of each for garnishing. Serve immediately. I don't fancy creamy Risotto, my family too. No chance to try out. Anyway, your looks good. I love a good plate of risotte! 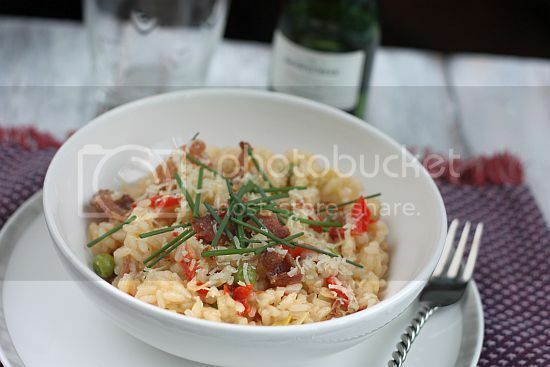 So far I have only made seafood with peas or mushroom risotto, have yet to try leek and bacon, must be yum! I have never tried Risotto in my life but have always been curious of how it might taste. Your appetising pictures really make me want to give it a try...! It's simple but you do need a lot of patience =P looks so yummy! I have always wanted to try to make Risotto but have not gone down to it. Yours look scrumptious! 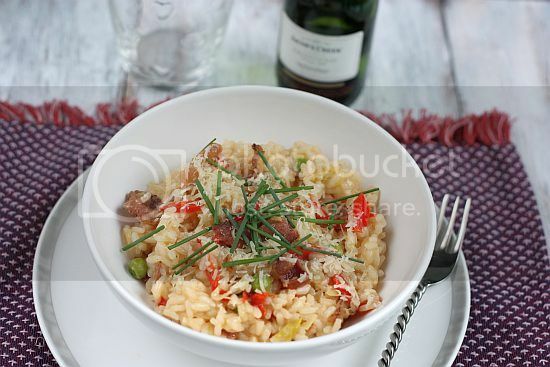 Perfect take on risotto using short-grain rice! 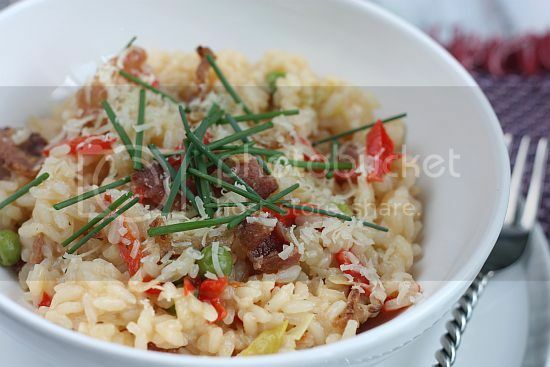 Love the flavours in this risotto. Very classic and delicious. I can get aching arm after stirring risotto! really nice combo with great colours. What a great risooto...love all the flavors going on in this one.